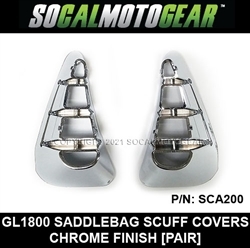 GL1800 SADDLEBAG SCUFF COVERS SoCalMotoGear.com - Professional Grade Motorcycle Lighting - Plug N Play Products - "Riding at night has never been brighter!" These Saddlebag Scuff Cover Inserts add an updated polished look. Easy install - simply snap into place for a secure hold. 30 DAY RETURN IF UNUSED/UNDAMAGED.